Color us excited but don't you just love it when food not only tastes good but also looks appetizing? Try your hand at our recipe for Rainbow Pasta. Cooking can be more exciting with unusual ingredients. 1. In a Chef’s Classics Ashley stock pot, boil salted water. Cook the colored pasta and set aside. 2. Sauté onion, garlic, beef, oregano and liver spread in the Ashley sauce pan. Cook for 5 minutes in medium heat. 3. 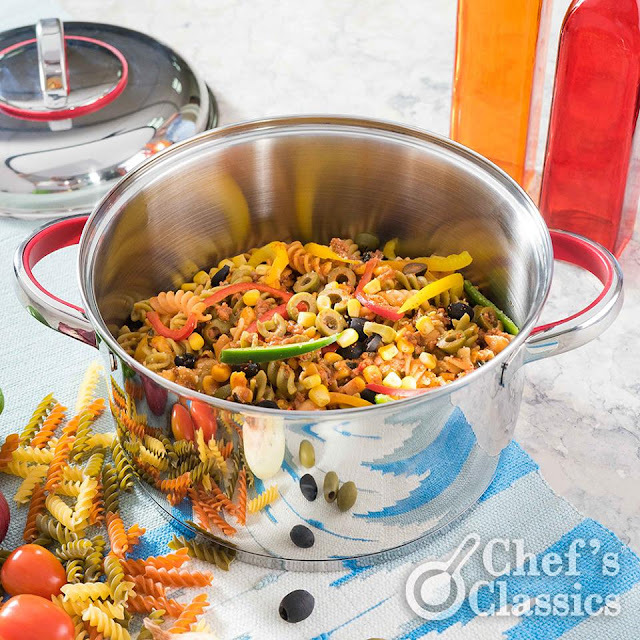 Add the bell pepper, corn kernel, button mushroom, olives, cherry tomatoes and spaghetti sauce. 4. Add 1 to 2 cups water if needed. Simmer for about 8 to 10 minutes. Once cooked, add the grated cheese, basil leaves and chili flakes. Season it with salt and pepper to taste. 5. Mix in the cooked pasta with the spaghetti sauce. Serve it with garlic bread if available.